Posted on Tuesday, January 22nd, 2008 at 5:34 am. The Hsu-nami. It’s an audacious rock band with a twist. Based in Mahwah, New Jersey, the group comprises standard rock band elements (Brent Bergholm- Lead Guitar, Vinny Belcastro- Guitar, Derril Sellers- Bass, John Manna- Drums, and Adam Toth- Piano/Synth). But in place of a lead singer, you’ll find 24-year-old Jack Hsu playing erhu, a two-stringed “Chinese violin”– revamped with electronic pickups, of course. So I sat down for a little online chat with Jack and got him talking about his music and his band. A: Hey Jack! I’ve had a chance to look at and listen to a lot of your stuff. 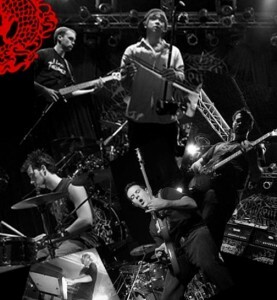 Hsu-nami is an interesting band with a unique concept—“erhu rock” as you’ve called it. How do you explain Hsu-nami to people who aren’t familiar with you guys? J: I guess it’s progressive instrumental rock music where Asian traditional erhu music fuses western metal, funk, and hard rock. It’s about cultures coming together to make new ones while paying tribute to the past as well. A: How did the concept come about? And how did you get the name Hsu-nami? 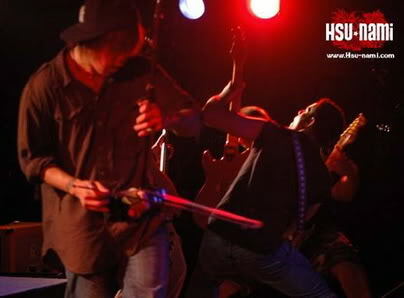 J: I used to play with this band or duet called Genso Fantasia with a guitarist and me on erhu. We’d play in cafés. And then one day I needed a backup band for our record release performance, so I asked my friend’s metal band to fill in. After a while, the guitarist moved to Japan and my friends that filled in really enjoy the music, so we decided to make that a real band. 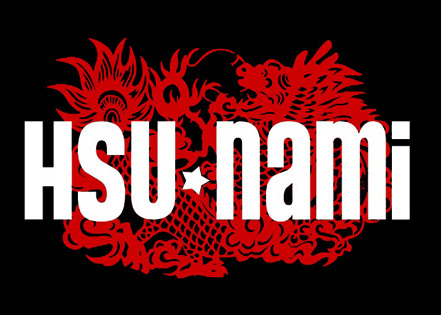 Hsu-nami was my nickname in college actually. Haha. I think it fits pretty well, and since it’s all instrumental, you can think of it with your own different descriptions. A: It is quite catchy, and I think fitting for your music with all the storm metaphors. J: Yeah, as long as people know how to spell it, haha. A: Haha. Yes, a common plight for many Taiwanese names. So I’ve read that you’re quite a multi-talented musician. What are some of the other instruments you play? And how does that influence the music you make with Hsu-nami? 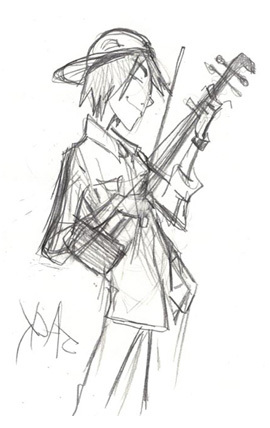 J: Hah, well I’ve played the violin since I was little, since I was four, and I picked up the erhu later. 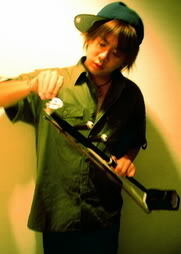 But since I knew how to play violin it was pretty easy to pick up the erhu. On our record it has my violin parts in couple songs. I play piano and guitar too, so I basically compose with those instruments. A: It sounds like quite the mix. What gave you the idea to learn erhu though? J: I guess it was my parents when I was little. Since I knew the violin, why not erhu? Especially since it represents traditional Chinese culture. I actually went to Nanking, China, to learn erhu for a couple months when I was in middle school. I play those other instruments pretty well, but everyone plays those here. Violin for me is too standard. There’s not enough freedom. But afterwards, I discovered improvisation and songwriting, which can make things mine. It’s just something that represents my identity. I like it that way. A: So as a listener, I’m always curious as to how the music actually gets made. What’s the songwriting process like for Hsu-nami? J: Well, it depends on the song. Sometimes I write songs and just record it myself and sent it to the rest of the band to listen to, and they will put their own parts into the songs. That’s what we usually do. One of the member just brings song ideas to the band, and we figure out if it works or not. Everyone has different influences, and they all match up pretty well. A: Well congratulations, because you just recently released your first EP in November. That’s really exciting! J: Yeah, Finally! It was November 30th, just recently. It was two years in the making. We recorded everything at our bassist Derril Seller’s home recording studio. It’s called Entering the Mandala, and there are seven tracks on the EP, plus bonus live tracks. A: Do you have a favorite track? J: Yeah, “The Entering of the Mandala,” the last track, because it means a lot. The song is inspired by Tibetan Buddhism. The Mandala is basically a religious belief about reaching the highest level of enlightenment. If you ever see a Mandala, it looks like a circle drawing, but you’re supposed to see it as a 3D object.. it is basically like a castle and there are different levels. the lowest level is suffering… death… and then each level just progresses up and up, better and better. The song is basically the same way. It starts from a slow intro that’s really, really sad and progresses to become happier and heavier towards the end. That’s how i wrote this song. I feel like playing music is a way to reach out to people. I’ve played music since I was a little kid. I was taught to practice music 12 hours a day and not to give up on something easily. I think it’s a good thing, because now when I’m older, I’m easily devoted to things that I truly care about. It made me have patience in everything. A: What do your parents think of this whole thing? J: They like it, I guess. They’re supportive. Actually, they always give me ideas of what I should do on stage. Haha. A: What’s your typical audience like right now? J: Well, all different kinds. All different ages. I guess it depends on our shows. We’re mostly playing around the New Jersey/New York area. We play in different venues—everything from bars to Chinese festivals to Asian events and college shows. We even opened for the Taiwanese death-metal band Chthonic (featured here in an earlier spotlight). A: What are your hopes for the band’s future? J: We are shopping for labels right now. We’re doing ok with publicity so far. People find us since we play a lot of shows and get some name out there. We are already working on a second album, and it’s already a lot more elaborate songwriting compared to the first album. Oh yeah, we want to tour Asia and the West Coast. And sell couple million records along the way. Haha. A: Well we wish you the best! And thank you for taking the time to chat with me. Is there anything else you’d like our readers to know? J: Thank you for your support, and be sure to check out our website! Indeed. Click below to see, hear, and learn more about The Hsu-nami. TaiwaneseAmerican.org is happy to present free autographed copies of The Hsu-nami’s debut album, Entering the Mandala. Email [email protected] with the subject line “hsu-nami” by February 17 and we’ll randomly select our winners. *EDIT* Congratulations Dan G. of Durham, NC, Erica L. of San Diego, CA, Young L. of Alameda, CA, Tiffany K. of Ann Arbor, MI and William B. of Berkeley, CA for winning the CDs!